Brigthline’s retractable gap filler extended on a prototype door. Fla.'s Brightline commuter rail system announced that its new trains will be the first in the U.S. to utilize retractable gap fillers, making boarding and disembarking the trains easy and convenient for all riders. 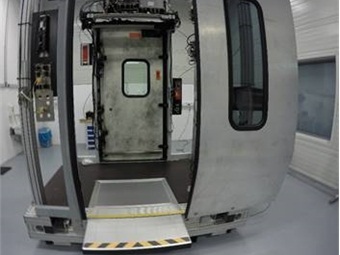 Brightline and Siemens collaborated with Bode to develop the custom gap filler that is integrated into the train car door system. Bode has gained global recognition for its custom-built door systems, which are in use on passenger trains and light rail vehicles across the world. Prior to the doors opening, the custom gap filler will extend up to 12 inches from the train and pivot to meet the station platform, creating a flush surface for passengers to cross and making it easy for those in wheelchairs, pushing strollers or luggage to board Brightline at stations in Miami, Fort Lauderdale, West Palm Beach and Orlando. Brightline’s trains are being constructed by Siemens at their state-of-the-art manufacturing facility in Sacramento, Calif. The first passenger coach shell was completed recently and is going through a finishing process, preparing it for final assembly. Brightline is expected to take delivery of the first train sets later this year. Construction is also underway on Brightline’s train stations in Downtown Miami at MiamiCentral, Fort Lauderdale, West Palm Beach and Orlando.